Piano Music Stand Solid Brass Book Page Holders. Do you have a problem with the music page flipping over when playing the piano?. If there are no holes in your music rest, drill two holes with drill size 2.5mm in your music rest and insert these page holders. Vintage Brass Hearth Trivet Music Stand British Made Musical Collectable. Dispatched with Royal Mail 2nd Class. Unusual Antique Painting Sign Wedding Music Stand Easel Hooks Brass And Iron. Genuine Victorian has Victorian registration number on it. Was found with a hoard of old paintings/frames etc sold as seen. has part of a bolt protruding from one side at the bottom (could be cut off) Dispatched with Royal Mail 2nd Class. Set of 5 matching vintage brass adjustable music stands. Ideal for to use as a music stand, to display a cooking book, for reading or as a decorative item. They would also be ideal for retail displays. They have a lovely weight to base and are adjustable in angle and height. They are only for table height use. Not extended they measure 13.5 inches in height. Good working order, and lovely vintage pieces! One of frames is a little bent out of shape but easy fix. Grab a bargain! Vintage Music Stand Solid Brass Book Page Holders-for Grands or Upright. Condition is Used. Dispatched with Royal Mail 2nd Class. Very decorative antique music stand, made from hardwood (mahogany, I think) and brass. The style is Victorian/Edwardian, but I don’t know how old it actually is! Parts included: Solo Bb cornet (conductor) x 4 Eb Soprano Cornet Repiano Bb cornet 2nd Bb Cornet x 2 3rd Bb Cornet x 2 Flugel horn Solo Eb horn 1st Eb horn 2nd Eb horn 1st Bb Baritone 2nd Bb Baritone 1st trombone 2nd trombone Bass trombone Euphonium x 2 Eb bass x 2 Bb Bass x 2 Drums Timpani. Portable foldable trumpet holder. 1x Tripod Stand. - Ergonomic folding design, lightweight iron feet material. - Material: Iron, plastic. - Folded Size(HxD): Approx. 1x Trumpet Stand. - Durable and detachable, tripod design is more stable. The product is new and in good conditon, just go ahead and buy! Fantastic antique brass music stand! This is a beauty! Measures 42" tall Combined shipping for multiple items won. Please see photos for more details. This is being offered with no reserve! All items are normally shipped within 2 days. All items must be shipped. I do not offer local pickup. 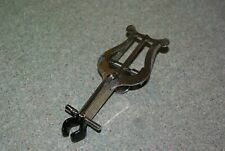 J.Higham Antique Brass Instrument Lyre Music Stand. Condition is Used. Dispatched with Royal Mail 1st Class. Up for sale is a collectible, brass-tone metal figural music stand figurine / place-card holder / ornament in excellent condition. Measures 3.75 in. tall Questions always welcome. We will gladly combine shipping on items won within 7 days of each other. Be sure to visit our eBay store! Rednosed Molly's Attic. Stamped 9 on brass and - 5TH LOYAL REGT on leather strap. This is a beautiful antique piece. In good condition for its age. The is a small dent in the bass and a the lip of the top piece has a curved lip. Pictures provided. This will be left in its original condition for the new owner to either clean or leave in original condition. MPN: B0406. Very rare and very hard to find retired collectible miniature. Pre-owned in good condition. This clock is a collector’s item and has not been tested. Product Line: Bulova Miniature Clock Series. 1 x Flute Head Crown Screw Cap. Made of nickel-plated solid brass,not fade. 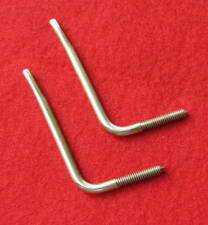 Material:Nickel-plated brass. Note: The color of the item may vary slightly due to photography and your own computer. Rate (item arrived).